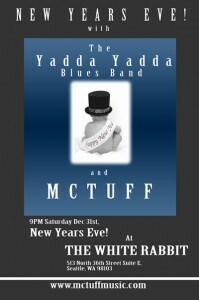 A few months ago I joined one of my favorite Seattle bands, McTuff, and I’m happy to share we’ll be playing a New Year’s Eve show at the White Rabbit in Fremont along with the Yadda Yadda Blues Band. McTuff is made up of Joe Doria on the Hammond B3 organ, Andy Coe on guitar, Cliff Colon on tenor sax and myself on drums. All of these guys are incredible players with complete facility and control on their instruments and really mature musical instincts. They know when to hold back, when to let loose and how to contribute to a group sound. They’re all great soloists and great ensemble players, which is a rare combination. Cover for the show is only $8 and tickets are on sale now, so be sure to get yours before they’re gone at Brown Paper Tickets! 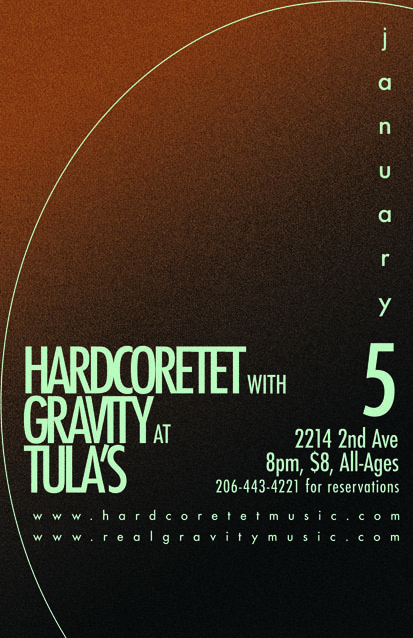 My jazz group, Hardcoretet, will be performing at Tula’s Jazz Club in Seattle on Thursday, January 5th. We’ll be sharing the stage with Gravity, another great Seattle band that plays melodic and driving instrumental funk and soul. The show is all-ages, gets started at 8pm and is only $8 at the door. Of all the venues in Seattle, Tula’s is probably the best for Hardcoretet both because of it’s intimate vibe and great sound. We’ll be playing tunes from Experiments in Vibe, Do It Live as well as brand new material. See you there!